Dudh kunda trekking is popular trekking trail in Solu Khumbu region though less high then the neighboring in Khumbu Himal range.Dudh Kunda Lake(milky lake) is situated at the foot of Number Himal, locally known as Shorong Yul Lha, "Protector of Solu region.Dudh Kunda (which literally means milky lake) is believed to be a holy lake and the locals believe that taking a dip in the holy waters will have the wishes granted also where you will enjoy and see panoramic Himalayan views of Everest, Number, and Everest Himalaya range etc also Green forest with Rhodendrendon flowers, pine tree + wild annimals /birds such as Moutain Thars,Bears, Leopard, Jackle, pheasant, and Milky lake. Dudh Kunda Trekking trail taking you through dense forests of rhododendron and a variety of wildlife. The hospitality of the locals is one of the most heart warming experiences of the solu area with depth experience of Himalaya journey trekking team professionals. Highest access of the trek: Kalapathar 5545 Meters. 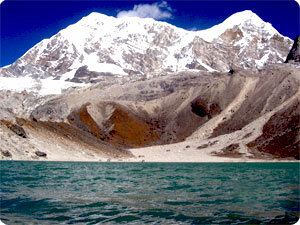 Himalayan sights: Mt. Everest, Amadablam, Thamserkhu, Nuptse, Lotse etc. Day 01: Arrival in Kathmandu 1334m, Himalaya Journey Treks & Expedition’s representative will transfer to hotel , Dudh Kunda trekking briefing with officially arrangements. overnight at Kathmandu. Day 16: After breakfast ,Jiri drive back to Kathmandu and transfer to hotel, overnight at kathmandu in Hotel. Day 17: After breakfast,Chutara by private vehicle van/Hicace/Bus drive back to kathmandu. overnight at Hotel in Kathmandu. Day 18: After breakfast, our tour guide will take to for historical monuments sightseing in kathmandu valley such as Bhaktapur, Pasupatinath, Boudhhanath, Kathmandu durbar square and Monkey temple(swyambhunath) and in the evening farewell dinner in Restaurant, overnight at kathmandu in Hotel. Day 19: After breakfast, Relaxing/shopping with own activities ,Himalaya Journey Treks & Expedition’s representative will drop to Kathmandu international airport for onward destination.